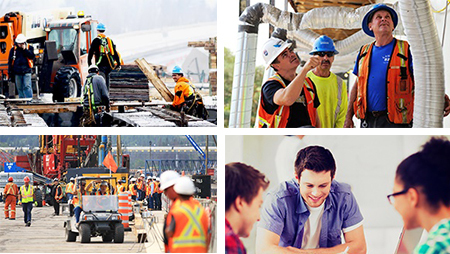 View all jobs at Pomerleau. Receive alerts about new jobs opportunities that match your interests. AT POMERLEAU, WE WORK HARD TO EXCEED THE CONSTRUCTION INDUSTRY'S STANDARDS OF EXCELLENCE. Working at Pomerleau means you will be part of a large family where strong interpersonal relationships, teamwork and closeness to management are valued. On a daily basis, we work together to achieve tangible results. At Pomerleau, mentoring is part of our culture. Experienced professionals work with young recruits to ensure that they grow into the job and acquire expertise from dynamic, well-balanced and high-performance teams. At the heart of our culture is a commitment to continuous improvement. We are constantly improving our practices. And we constantly call on our employees to contribute to achieving this goal on a daily basis. That is why we value participative management. We want to hear what you think. Your ideas matter! Pomerleau is growing. That's why we can offer you stimulating challenges and opportunities for professional development. Continuing education is crucial to developing your competencies. The right tools mean you can work with energy and rigour to meet--and even exceed--our clients' expectations. Talent Network will enhance your job search and application process. Whether you choose to apply or simply enter your information in our system, we look forward to staying connected with you. Receive alerts about new job opportunities that match your interests.